Discover the unique charm and the colourful history of the vivacious village of Koprivshtitsa. Narrow alleys and century old farms and town houses in their peaceful and romantic surroundings harbour a variety of impressions just waiting to be experienced. Koprivshtitsa is protected in its entirety as a historical monument. The numerous museums, the old stone bridges and walls, the wooden yard gates, 100-year-old buildings and courtyards in their typical colours, all take you back to time long gone. Koprivshtitsa plays a significant role In Bulgarian history. 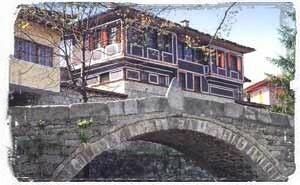 For Bulgarians, Koprivshtitsa is a symbol for the freedom gaines after hundred years of Turkish occupation. An astounding number of renowned Bulgarians - authors, poets, revolutionares and politicians - have come forth trom the small mountain village of Koprivshtitsa. There are "each of offering" six museums in Koprivshtitsa, each offering inside into the various aspects of culture, history and lifesyle of the bygone era.